Preoperative planning remains crucial for successful Spinal Schwannoma treatment and relies to a great extent on proper tumor classification. The literature includes multiple classification systems for spinal schwannomas, each of which is associated with both positive and negative ramifications for preoperative planning 1) 2) 3). 4). Consequently, there is a lack of consensus concerning the optimal system of classification for schwannomas 5). The literature includes numerous schwannoma classification systems. Jinnai and Koyama 6) classified schwannomas into five groups based on the relationship between the tumor and the dura mater and/or intervertebral foramen. This classification system is useful, as it takes into consideration tumor localization relative to the dura, but it does not take into account volume, which is important for preoperative surgical planning. Sridhar 7) was the first, in 2001, to suggest a classification system of benign spinal schwannoma including giant and invasive spinal schwannomas (type I to V). Park et al. 8) reported the use of a new classification system, and Type VI and Type VII were added. But the classification system as defined by Park et al. were inadequate because both the figures and the tumors were not clearly described in their manuscript. A case could not be classified based on Sridhar’s spinal schwannoma classification system. Thus, as shown in a case, of Kotil type VIII must be added to the modified Sridhar classification (Kotil classification) system of benign spinal schwannomas 9). Sun and Pamir however, think classification of seven distinct types of schwannomas using Sridhar et al.’s system is not practical because the characteristics of seven tumors types are difficult to remember. Another drawback of their system is that tumor volume is only considered for dumbbell-shaped tumors, and craniocaudal dimension is not a consideration, which limit the diagnostic value and consistency of the classification system 10). Asazuma et al. 11) devised a schwannoma classification system for cervical dumbbell- shaped tumors that consisted of nine categories. An important drawback of their classification system is that it cannot be used for thoracic or lumbar schwannomas, which are as common as cervical schwannomas. Type 1 intradural extradural restricted to the spinal canal. The constriction occurs at the dura. IIa do not expand beyond the neural foramen. IIb inside spinal canal + paravertebral. 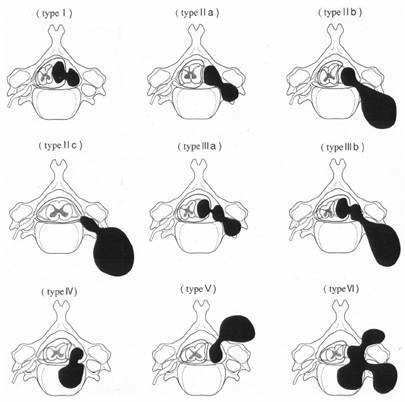 Type IIIa are intradural and extradural foraminal, IIIb are intradural and extradural paravertebral. Type IV are extradural and intravertebral. Type V are extradural and extralaminar with laminar invasion. Type VI show multidirectional bone erosion. Craniocaudal spread: IF & TF designate the number of intervertebral foramina and transverse foramina involved, respectively (e.g. IF stage 2 = 2 foramens). Schwannomas involving C1 & C2: May involve vertebral arteries and require additional caution. Tumor volume = 4 / 3 π × (craniocaudal length / 2) × (transverse diameter / 2)2 . Sridhar et al.’s 12) classification system is arguably the most similar of the previously reported systems to the novel classification system described by Sun and Pamir however, they think classification of seven distinct types of schwannomas using Sridhar et al.’s system is not practical because the characteristics of seven tumors types are difficult to remember. Another drawback of their system is that tumor volume is only considered for dumbbell-shaped tumors, and craniocaudal dimension is not a consideration, which limit the diagnostic value and consistency of the classification system 13). Based on the findings, Sun and Pamir think that all schwannomas should be classified according to localization and volume, so as to achieve the desired benefit of classification—ease and reliability of preoperative decision making and preparation. In addition, this classification system makes tumor localization easier to understand, as compared to other systems, and is suitable for all schwannoma types. It is a simple and effective tool that shows extremely helpful for avoiding unnecessary surgical approaches and complications. Due to the system’s simplicity of having only three tumor groups and its reliability—indicated by the associated low postoperative side effect rate, use of this novel classification system should be considered by any surgical department that seeks a standardized schwannoma surgery protocol. 14). Chowdhury FH, Haque MR, Sarker MH. High cervical spinal schwannoma; microneurosurgical management: an experience of 15 cases. Acta Neurol Taiwan (2013) 22:59–66. Sun I, Pamir MN. Non-Syndromic Spinal Schwannomas: A Novel Classification. Front Neurol. 2017 Jul 17;8:318. doi: 10.3389/fneur.2017.00318. eCollection 2017. PubMed PMID: 28769861; PubMed Central PMCID: PMC5511849. Sridhar K, Ramamurthi R, Vasudevan MC, Ramamurthi B. Giant invasive spinal schwannomas: definition and surgical management. J Neurosurg (2001) 94:210–5. Park SC, Chung SK, Choe G, Kim HJ. Spinal intraosseous schwannoma : a case report and review. J Korean Neurosurg Soc. 2009 Oct;46(4):403-8. doi: 10.3340/jkns.2009.46.4.403. Epub 2009 Oct 31. PubMed PMID: 19893734; PubMed Central PMCID: PMC2773402. Kotil K. An extremely giant lumbar schwannoma: new classification (kotil) and mini-open microsurgical resection. Asian Spine J. 2014 Aug;8(4):506-11. doi: 10.4184/asj.2014.8.4.506. Epub 2014 Aug 19. PubMed PMID: 25187870; PubMed Central PMCID: PMC4149996.